Is perioral dermabrsion the same thing as microdermabrasion? NO. They are completely different. Microdermabrasion is performed by an aesthetician in order to remove the most superficial layer of dead skin cells that reside on your face. Microdermabrasion is akin to a very superficial polish of the skin. Microdermabrasion will not help the lines around your mouth. Dermabrasion is performed by a physician experienced in the procedure. Using a trained eye and skilled hand, the physician will remove many layers of skin to penetrate the skin’s deepest layers. This results in the removal of wrinkles/lines in addition to stimulation of collagen production by your own skin. Our patients rarely experience any pain after the procedure. If there is any discomfort it is alleviated with over the counter Tylenol. How long after the procedure until I see results? The skin is completely healed in about 1 week. At this point you will notice an improvement in your appearance. This will gradually improve as the body builds new collagen stimulated by the procedure. Perioral dermabrasion achieves permanent results after all the swelling subsides. Where is perioral dermabrasion performed? Most of our patients elect ot have this done in the comfort of our procedure room under local anesthetic. It can also be performed in the operating room, especially when being combined wth other surgical procedures. What about using dermal fillers for the lines around my mouth? Perioral rhytids are located on the surfcae of the skin. Today’s available fillers do not adequately treat these types of lines. In fact, we see many patients who are unhappy with the results of fillers in this specific region. 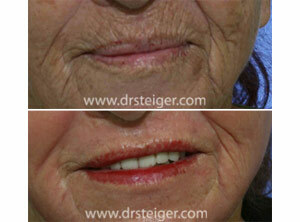 In addition, fillers used to treat this area can distort the lip and smile. This can lead to a very unnatural look that Dr. Steiger avoids. Can you use Botox or Dysport to treat the winkles around my mouth? Yes. In the less severe cases of perioral rhytids, Botox and Dysport can be helpful in improving the appearance of your mouth.